LINING IT UP - Professional golf management major Todd Schaferman, a junior from Hooper, lines up a putt. Photo by Publications and Photography. Outside the Sun Belt and far from the nation's golfing hotbeds, UNL's new professional golf management major is off to a strong start. 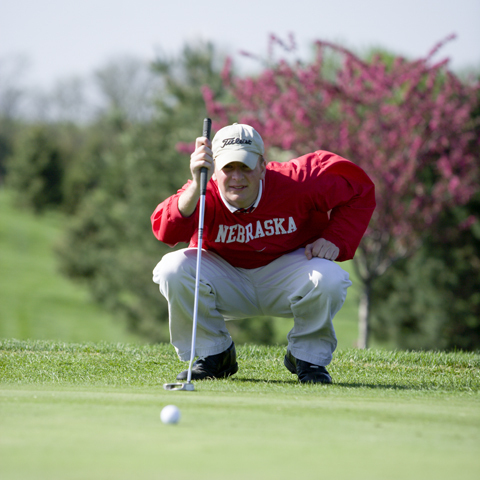 UNL students majoring in professional golf management scored a national first over the weekend of March 11. UNL's offices of Research and Technology Development will join forces with Bio Nebraska Life Sciences Association and its Nebraska biotechnology partners April 9-12 in the largest biotechnology convention in the world, telling more than 18,000 international visitors to Chicago's Bio convention that "Bio's Hot in Nebraska." U.S. Supreme Court Justice Ruth Bader Ginsburg will be the Roman L. Hruska Institute for the Administration of Justice lecturer at noon April 7 at the UNL College of Law. When UNL junior Rachael Stern decided to formalize her study of gender theory, sociology and gay and lesbian studies, her only option was to create an individualized minor, composed of courses from multiple departments. Nebraska's Republican candidates for governor (top, from left) Tom Osborne, Dave Nabity and Dave Heineman answer questions during their March 26 debate at the Lied Center for Performing Arts. A total of 481 people attended the debate, including about 40 students (below) who joined the candidates on the stage. Televised live across Nebraska on NET Television, the 90-minute debate was organized by ASUN. According to Matt Schaefer, ASUN president, more than 100 questions for the candidates were suggested by UNL students. Photo by Tom Slocum/Publications and Photography. "Sowing Success" will be a well-known phrase around the College of Agricultural Sciences and Natural Resources as students and faculty celebrate CASNR Week April 8-13. UNL students try out the Business Information Technology Mobile before it hits the road. The BIT Mobile is a traveling technology classroom in a 29-by-9-foot gray trailer with Husker red lettering that will soon offer rural communities a variety of business and information technology classes and training. The BIT Mobile was developed by UNL Extension information technology educators. Courtesy Photo/Institute of Agriculture and Natural Resources. The Institute for Ethnic Studies is coordinating a series of events April 1-7 to inform campus and local community about the discipline of ethnic studies. Lori Eagle Claw Straatmann is a Court Baroness, of the Barony of Mag Mor, of the Kingdom of Calontir. The Lied Center for Performing Arts and the Omaha Performing Arts are hosting the National Symphony Orchestra and its music director Leonard Slatkin in a weeklong residency that ends April 1. Mike Cloud, an emerging artist whose work has won favorable reviews in The New York Times and The New Yorker, will open his first solo museum exhibition April 4 at the Sheldon Memorial Art Gallery. Peter Beeson of Lincoln has been actively photographing the scenic beauty of Nebraska for 30 years, and in the last four years his interest has expanded to include capturing images of valuable and beautiful - but elusive - dragonflies. Known best as a painter of light and space of Nebraska plains, Keith Jacobshagen has curated an exhibition of drawings selected from the permanent collection of the Sheldon Memorial Art Gallery. This free exhibition opens at the Sheldon April 7, with a public reception beginning at 5 p.m. Visitors may view the selections through June 4. Marilyn Chin will be reading as a part of UNL's Visiting Writers' Series 7 p.m. April 6 in the Great Plains Art Museum. The event is free and open to the public. The fifth and final series concert for the Lincoln Friends of Chamber Music is at 8 p.m. April 1, in the Sheldon Memorial Art Gallery. The Lincoln Print Group will hold a print sale March 30-April 1 in Richards Hall Room 121.1 (conference room). On Sept. 12, 2002, 20 "at-risk" 12-year-old boys from inner-city Baltimore left home to attend classes in Africa. The Master of Fine Arts Thesis Exhibitions continue in April at the EisentragerHoward Gallery in Richards Hall. The MFA Thesis Exhibition II runs April 3 to 11 and includes MFA candidates Carlos Guerrero, painting, Jeremy Johnson, painting, and Dennis Schmickle, graphic design. A reception will be held on April 7, from 5 to 7 p.m.
"The Will Rogers Follies," winner of six 1991 Tony Awards, will be at the Lied Center for Performing Arts for four performances April 7-9. Show times are 7:30 p.m. April 7; 2 p.m. and 7:30 p.m. April 8, and 2 p.m. April 9. Theatrix, the UNL student producing organization, will present "Reckless," the final production of the spring semester, beginning March 30 on the Howell Stage in the Temple Building. Pianist Alexander Kobrin, the 2005 gold medal winner from the Van Cliburn International Piano Competition, will perform at the Lied Center for Performing Arts, 7:30 p.m. April 4. What a marvelous gift is the imagination, and each of us gets one at birth, free of charge and ready to start up, get on, and ride away. Can there be anything quite so homely and ordinary as a steam radiator? And yet, here, Connie Wanek, of Duluth, Minnesota, nudges one into play.